Tuna salad sandwiches are always a hit. Our take on the classic tuna sandwich includes celery, green onions, dill pickles and fresh dill. 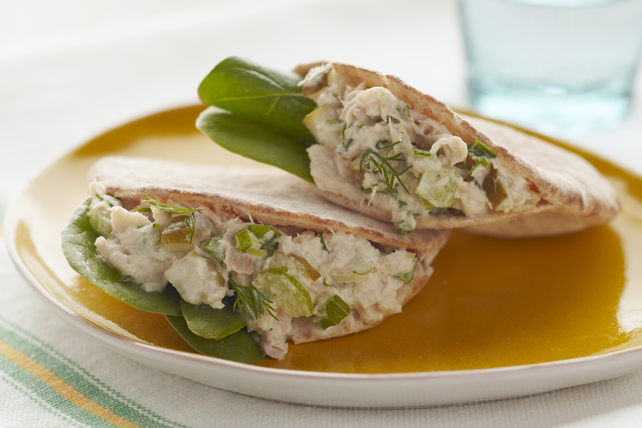 Served in mini pita pockets, these sandwiches are great for lunch or a midday snack. Combine all ingredients except pitas and spinach. Fill pita pockets with spinach and tuna mixture. Serve with a fruit salad and assorted cut-up fresh vegetables. Wrap up this easy-to-make tuna pocket and take it along as part of your lunch instead of eating out. It will help you eat right.